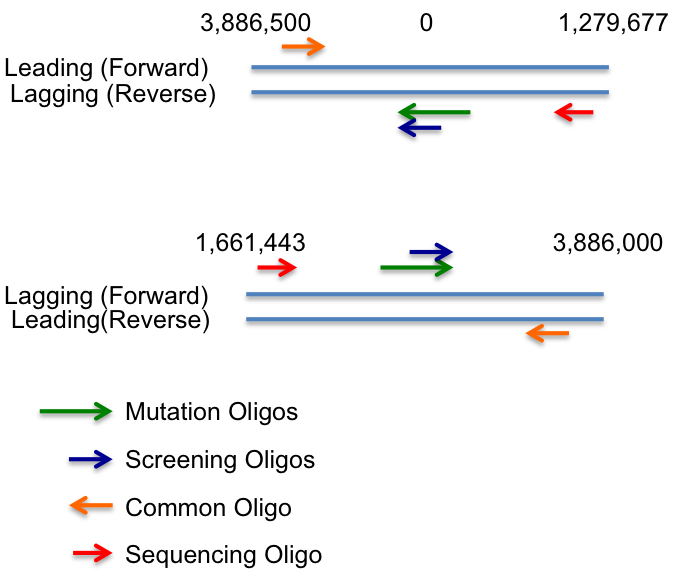 2 different 71bp oligos will be needed for each mutation. Oligo 2 will have your mutation with 35bp of background on each side, and Oligo 1 with that mutation plus 2 bp mutated to random sequence on each side of your mutation. Following examples based on 1bp SNP. b = background, M = mutation of interest, R = Random mutation, can be any single base substitution, but not degenerate. Mutations MUST be placed on the lagging strand. If mutation location between ~ 3,886,000 and 3,886,500 or ~1,279,500 and 1,662,000 it's probably best to try both strands and see which is better. Expect 100+ fold increase in efficancy for lagging strand. Should be ~20bp long, amplicon of ~150+ bp, and one primer must have 3' bases as mutations of interest. Both screen's can be done with a common primer at least 150 bp away on the opposite strand. Primer to be used for final sequencing to verify mutation on correct background. Primer should be ~20bp long, ~150+ bp upstream of Mutation screen oligo. Transform λ red plasmid into cells and select with appropriate antibiotic. Make new line (background of interest with λ red plasmid) electrocompetent. Must induce λ red proteins before centrifigation. See ProcedureGenomeModificationDatsenkoWanner Day 2 for detailed induction information. Thaw 50 μL aliquot of electrocompetent cells on ice. Transfer cells to electroporation cuvette. Add ~100ng of Mutation Oligo 1 to pre-chilled cuvette. M.W. of ssDNA = (# nucleotides x 303.7) + 79.0. Therefore assuming 71 nucleotides, MW ~= 21642.41. Typical dilution of oligos is 100μM. Therefore ~2164 ng/μL. Electroporate, and immediately add 1ml of room temperature LB to cuvette. If preparing multiple samples, add LB before doing next electroporation. Cuvette with LB can be left at room temperature while rest of electroporations are finished. Transfer all liquid from cuvette to sterile tube for 30C outgrowth. If no selectable phenotype, 30 minutes is best. Explanation: Cells typically have 4-8 copies of the chromosome per cell when recombination takes place, but recombination will typically only take place on a single strand. 30 minutes of outgrowth allows the cells to recover, but chromosomes will not yet have segregated. Colonies will therefore be a mixture of recombinant and parental cells, with percentage of recombinant cells being between ~25% and 12.5%. Colonies that initially test present for transformants can then be streaked for single colonies which will be found at between 25 and 12.5%. Comparatively if chromosomes allowed to segregate, 4 to 8 times more colonies will need to be screened to find a single transformant. If mutation causes selectable phenotype, more than 2 hours of outgrowth should be performed in 10mL LB. Allow plate to incubate overnight at 30C. Warning: lambda red plasmid is temperature sensitive above 32. PCR with Mutation Screen Oligo 1 and Common oligo. Because the 3' mutation screen oligo will only bind to DNA that has been mutated, presence of a band signifies recombination. Likely that the brighter the band, the better candidate (ie greater percentage of cells recombinants). 30 cycles of standard colony PCR conditions acceptable. Initially test 40 colonies is recommended. Be sure to either patch cells or store in small amount of saline. If cells patched, allow to grow overnight and re-plate for single cells following day. Positive 2-3 positive colonies should be spread for single cells and incubated overnight at 30C on LB with antibiotic. Single colonies from plates should be subjected to the same protocol as was used on Day 1. Need experimental validation: 20-30 colonies should be sufficient to screen. Positive colonies should be used to inoculate LB+antibiotic overnight 30C cultures. Positive colonies can be PCR'd with common primer and sequencing primer and sent for sequencing off either primer if desired. Should not be necessary under normal circumstances. Make freeze down of overnight culture, this is an intermediate with a 5bp mutation. Make cells electrocompetant as previously being sure to induce the λ red proteins. Electroporate as in Day 0, but use Mutation Oligo 2. Repeat Day 1 protocol using Mutation Screen oligo 2 rather than 1. Positive colonies should be used to inoculate o/n cultures. These should contain the correct single base mutation. Additional sequencing PCR needs to be preformed. This should be using common primer and sequencing primer. Submit sample for sequencing with either primer.